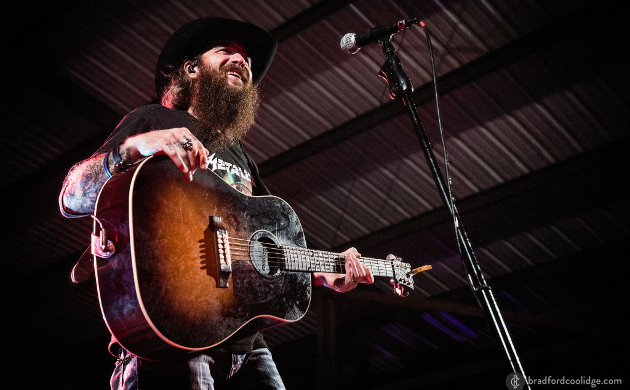 Country revivalist Cody Jinks and his management are planning to launch a new festival in his hometown of Ft. Worth, TX this August that will be curated by Jinks himself. Though the specific dates, location, and lineup have yet to be announced, we know it will be called the Loud and Heavy Festival and include about 10 to 12 bands. It will be an all-day event that will have a capacity of up to 15,000 people. The news comes out of the announcement earlier this week that the management and booking apparatus behind Cody Jinks, Whitey Morgan, Ward Davis, Blue Water Highway, and Sunny Sweeney is being revamped in a big way, as the manager for these artists, Arthur Penhallow Jr., is launching a new company called True Grit Management. Arthur Penhallow Jr., who has previously worked for C3 Management and Punch Enterprises, has acquired CTK Entertainment, operated by Michael and Carrie Krug, along with the rest of the CTK Entertainment staff to form True Grit Entertainment. Previously, Arthur Pehallow helped to represent Kid Rock and Bob Seger with Punch Andrews as part of Punch Enterprises. In the words of Wooderson, Alright alright alright. No one is booking shows that far out yet so this could be at the top of the list. And not a bro within sight. Suddenly the world doesn’t seem so terrible. Any new information on Sturgill cancelling at Pot of Gold? I like his old thrash metal band, Unchecked Aggression, a decent amount…. It’s a little dated and he’s got a bit of a case of Hetfield-itus but it’s worth a listen. Are you a thrash metal fan in general? I thought that was pretty terrible. Far too long of a song for the amateurish/generic riffing contained in the song. I can understand keeping things simple for a certain feel but then shorten the song to 3 minutes instead of over 5. I don’t think it’s great, but I don’t think it’s terrible. My taste in metal runs more towards technical death metal. I probably shouldn’t have called it terrible, it just seemed to drag on since it was basically straightforward simple music. It’s what I would expect from high school kids in their first 6 months of playing together. I’m a metal nut and couldn’t see myself wanting to check out more of his metal music. Speaking of tech-death though, one of my favorite albums of 2017 was Archspire’s Relentless Mutation. I used to love technical death metal but it has become so much of the same which is why Archsprire’s album caught me off guard. It’s super technical but it slows down plenty of times and weaves together all the instrumentation in ways that keeps your attention and keeps you coming back for repeated listens. It’s not just blasting, sweeping, and throwing odd time signatures for the sake of being technical. I gave it a listen for snicks and giggles. I was never a thrash guy more of a traditional metal guy but because Cody’s so good now I wanted to hear where musically he came from. I like when he weaves the past in his current lyrics. The song Rock And Roll from The Adobe Sessions is great! I’m Not The Devil is a great album as well. I can’t wait for the new album. Again I’ll say it………without this site I wouldn’t of known he existed and I thank everyone here for that. Why don’t you give credit to the actual author of the article?